The second SBAI research seminar for the 2011-2012 academic year will feature Mary Greitzer, Assistant Professor of Music Theory. 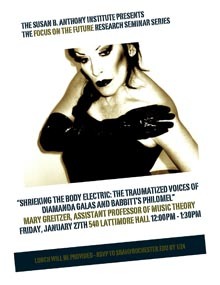 Greitzer will discuss her work titlted "Shrieking the Body Electric: the Traumatized Voices of Diamanda Galas and Babbitt's Philomel." Her work deals with electro-acoustic solo vocal performances addressing sexual violence, with themes of voice, body, trauma, madness, redemption, transfiguration, and cyborg feminism in the vein of Donna Haraway. Lunch will be provided! Please RSVP to sbai@rochester.edu by 1/25/12.